Squash House Quilts: Vintage Thingie Thursday - Shawnee! Vintage Thingie Thursday - Shawnee! 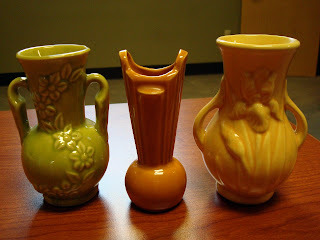 Today I'll show you a little bit of my large collection of Shawnee Pottery. I got the bug from a long time friend who has the most amazing house in Napa filled with incredible Art Deco collectibles. I think I can blame Robert for most of my "collecting addiction"! We've had a lot of fun over the years haunting antique malls! When he comes to visit us from California, Mr. Squash refuses to go along with us to the antique malls ---- we tend to get a little silly and crazy - he prefers to see the "show" when we arrive home! 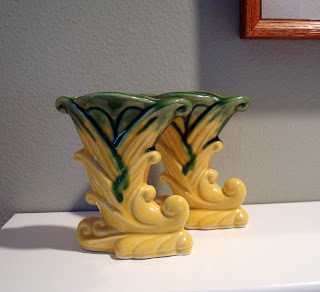 Robert gave us this pair of vases below after staying at our house one year...right now they're on the mantel, but I also use them on the dinner table. Shawnee was started in 1937 in Zanesville, Ohio and remained in production until 1961. They produced all sorts of fun figurines, lamps and even a couple of lines of dinnerware - anyone remember Corn King? I mostly collect green and yellow pieces as they go best with my decor. 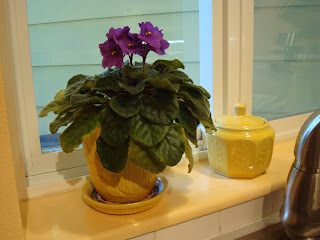 Below on my kitchen windowsill is one of their planters and an African Violet that has been in it since 1996! Next to it is one of the earliest Shawnee pieces, a sugar bowl, in which I keep little packets of Splenda. I was fortunate to find this one completely intact and pristine! I love this vase - it looks great with freshly picked flowers! This is a rare cat creamer. I saw him tucked in a back corner of an antique shop in Southern New Jersey several years in a row while visiting Mr. Squash's dad. It was always in the same dark spot! I really wanted it, but the price was too high and I never seemed to be able to talk them down. A few years back we visited the shop again - obviously the price was still too high for anyone as it was still there. This time I managed to talk them into a more reasonable price and it came home with me! I also collected a few pieces for my office. Below are more very early pieces that sit on a shelf behind my desk. I brought them down for a photo. 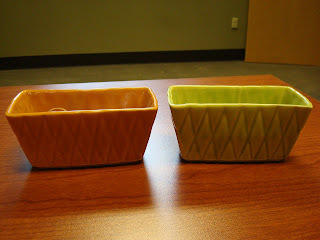 I love these colors and may just keep my eye our for more for the Squash House! The light in my office was not good for photos of these, so click on the pictures for a better view. This is the Gondola planter - isn't it fun? I don't have anything planted in it because again, the light isn't great, but I think once we move to the Squash House I'll put a little ivy in it. One time when Robert was visiting us, we walked into a small antique store a block from my office. We weren't at all impressed with what they had, but on the way out the door I spied these two on a bottom shelf - score! I use the one on the left for rubber bands and the other one for paper clips! Sometimes we have to fight over a certain Shawnee piece - we've given more antique mall proprieters a raised eye - LOL! Shawnee has the neatest logo below! Not all pieces are marked with this, however. Many have USA and a number or nothing at all. It takes time and research to get to know what is really a piece of Shawnee as there are a lot of imitations. I will probably make a solo trip to the Squash House tomorrow for a few days. Need to check on the cupboard door progress and talk to an electrician or two about some upgrades. Hopefully I can post from there! Nice collection. I am going to look at the antique stores for some of the pottery. Not necessarily to buy but just to see if I can find some. Love the cat creamer. I'm not familiar with Shawnee pottery but it's beautiful. I love the vase with the leaf impression and the gondola. Sad but many Zanesville pottery places have closed down. One of my favorites, Fioreware, closed a couple of years ago. Those are just beautiful! I love old Shawnee too, especially the pale green. Don't you just love finding hidden treasures in antique stores? Love your cat creamer! Thanks for sharing. Thanks for the little Show and Tell. I especially like the vase with leaf vine. Very nice collection. What a beautiful collection. I love all your pieces..and yes, I remember Corn King. I always loved those "corns" and still do. Just never see them anymore. Happy VTT and have a most lovely weekend. I've never heard of Shawnee pottery. It looks similar to McCoy in style and appearance. I have a few McCoy pieces but nothing like your collection of Shawnee. Isn't the thrill really in the hunt? It's so much fun to come across something that you both like and collect. I try not to collect any of these things; my mother, grandmother, aunts were practically OCD about collecting, so I'm scared of the bug--except for fabric of course. Hey Candace...great pieces! 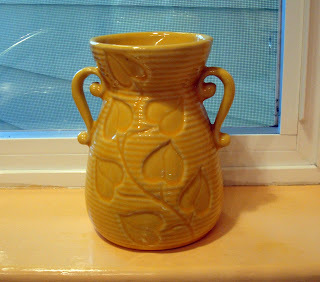 I don't collect any one particular type of pottery but when I read your post and you mentioned the corn man or something it got me to thinking, I have a corn pitcher on my shelf that was my grandmother's. I've had it since 1985 when she passed away and I remember as a kid she'd make us fresh lemonade in it. I just pulled it off the shelf and it's a Shawnee piece!!! Is this valuable stuff or just to people who like it? oh my Candace! I hadn't heard "corn king" in years! My parents used to have some of their pieces. Thanks for the walk down memory lane! They are all beauties! I love them. Of course I love the cat that caught the cream the most. You've got a lovely collection. Candace, Thanks for sharing your gorgeous collection and for the lesson too. I have seen but never purchased Shawnee pottery. Usually too expensive for me. But your mention and picture of the USA on the bottom sent me to my cabinets for a couple of bowls! Now I'm gonna do some research to see if they may be Shawnee too. I'm not familiar with this type of pottery. It's quite pretty! You have quite the collection! Your items are charming. Thanks for sharing. what stunning pieces..i adore that little kitty!! for sharing these with us! Wonderful pieces and a wonderful friend to hunt them with. Thanks for sharing them with us. I love the colours of your pottery. They all look very special, like the office vase with the iris(?). What a lovely collection. It must've been so much fun to browse around and find them. Good luck with the electricians. Well for goodness sakes, I somehow missed your post...and your first one too! I am sorry! Gosh. So Sorry!!! Welcome to Vintage Thingies Thursday...a little late! What a great first post. I clicked on your blog...and knew right away somehow I missed this post, I better get my act together!! 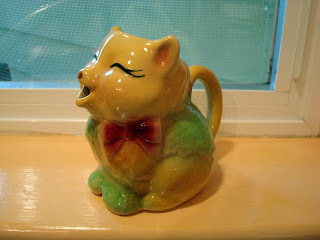 I love that cat creamer, it is just too cute! Have a great rest of your weekend, and see ya' next week. I have commented on your collection and I still love your pieces......and yes, I do remember corn king. I stopped by to visit, and what do I see? A post on Shawnee! I have a cookie jar that was my mother's and I grew up stealing cookies from throughout my childhood. I don't use it for cookie storage anymore, but it's a wonderful reminder of my mama. I have become a fan of Shawnee as a result of that cookie jar, but have not seen most of the pieces you have. Thanks for sharing! 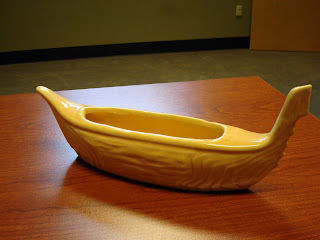 Love your collection of Shawnee; I've always loved the corn pottery. No pun intended...corny but still lovely. Flea Market Fancy and a Thank You!